Ind. Eng. Chem. Res., accepted. Lithium silicate (Li4SiO4) is a promising high temperature CO2 sorbent because of its large CO2 capacity at elevated temperatures with low materials cost. However, the conventional nonporous Li4SiO4 shows very poor CO2 adsorption kinetics. 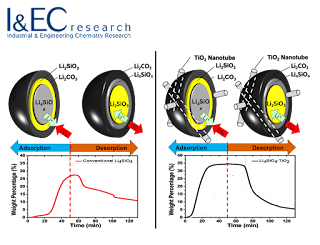 Thus, a Li4SiO4–TiO2 nanotubes complex was synthesized where LiOH and fumed silica would be calcined around TiO2 nanotubes. 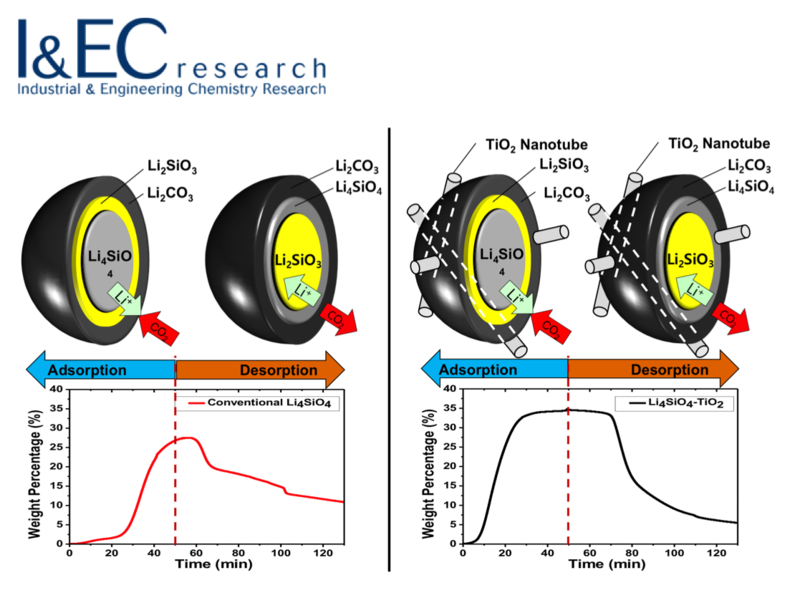 TiO2 nanotubes in Li4SiO4 structure functioning as open highways, lithium ions were able to channel through the bulky structure and enhance the sorption kinetics, leading the total adsorption capacity to near theoretical values. Furthermore, cyclic studies at 700 °C revealed strong stability over at least 10 cycles. These findings indicate that stability and kinetics of CO2 sorption can be greatly improved by the nanotube composites of known adsorbents.